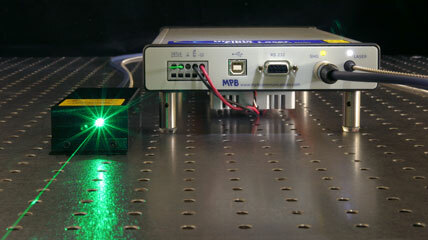 January 4, 2010 - MPB Communications Inc. has introduced yet another wavelength to their Visible Fiber Laser Series at VFL-532. The VFL-P-532 can deliver up to 5 watt of CW power from a compact laser head measuring only 132mm x 50mm x 30mm (L x W x H). The laser emitting head is connected to the drive laser unit via an armored optical fiber cable. The emitting head is in a compact, ultra robust enclosure that can withstand vibration up to 2G in the vertical and horizontal plane. The all-fusion-spliced optical train eliminates the traditional concern of keeping optics clean and cavity alignment sensitivity to temperature and mechanical vibrations. This high reliability maintenance free laser comes with a user-friendly graphical user interface. The compact 5W 532nm laser was developed as an alternative to the larger, high power consumption, water-cooled laser sysem as it will allow the end user to provide integration solutions that were not possible before in areas of Optical Molecular Imaging, Flow Cytometry, Microscopy, DNA Analysis and Cell sorting and Sequencing. Other applications include Lithography, Holography, Interferometry, Forensics and Spectroscopy. Other wavelengths available in the VFL-Series include 514, 560, 580, 592, 628, & 642 nm.